Choosing to take a Li river cruise from the small Southern Chinese city of Guilin to the picturesque town Yangshuo is a fantastic way to experience the beautiful river and incredible towering karst mountains which has made the Li River so famous. The highlights of this Li River boat cruise include karst mountains, villages lining the banks of the Li River, farmers at work, rural scenery, fishermen, animals and amazing scenery. ​Visitors board boats at either Mopanshan (3 Star Li River) or Zhujiang Pier (4 Star/4.5 Star Li River Cruise), which are both located approximately 35 kilometers (40 minutes driver subject to traffic) from Guilin City. 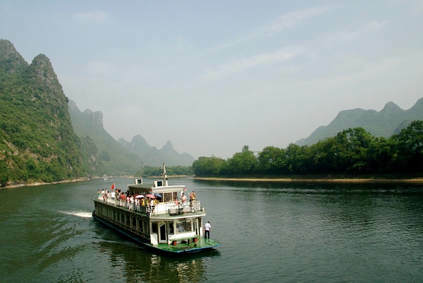 Once on-board, the cruise boats travel downstream, weaving in between seemingly endless numbers of mountains appearing from both sides of the Li River. The entire route between Guilin and Yangshuo is famous and equally as beautiful with the Yangdi to Xingping section of the Li River Cruise considered to be the most beautiful section of the Li River. ​Aside from the big boats traveling downstream, visitors also have the choice to book the 'private rafts' that travel upstream and downstream between Yangdi and Xingping. These shorter routes are on-board motorized rafts (not bamboo rafts) made from PVC piping. ​The number of visitors these rafts are permitted to allow is a maximum of 4 persons (plus the rafts-man) and the operations are affected by weather and water levels. Last minute cancellations due to heavy rain or high water levels are very common (particularly during rainy season in May to July) so please be aware of this if interested. Moreover, aside from the potential cancellations, age and height limits also apply. Visitors under 120 cms tall or over 70 years of age are not permitted to board the rafts. There aren't mandatory checks of every persons identification but if the ticketing staff consider somebody to be under the height requirement or over the age allowance, they will check (either height check or require identification to prove age). Visitors who are pregnant are also not permitted on-board the private motorized rafts. These boats depart in the morning from Guilin Pier to Yangshuo (West Street) & in the afternoon from Yangshuo Pier (Xingping) to Guilin Pier, allowing visitors to take a cruise, both ways to & from Guilin! ​The interior of the boat facilities and overall cleanliness are at a good level, with larger, comfortable seats as well as clean bathrooms. The number of person's on-board is approximately half the Superior 3-Star Boat Cruise and there isn't as much microphone usage on-board. 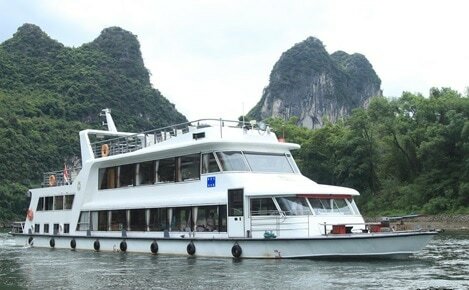 The Superior Li River Cruise is the most common and popular Li River Cruise boat. 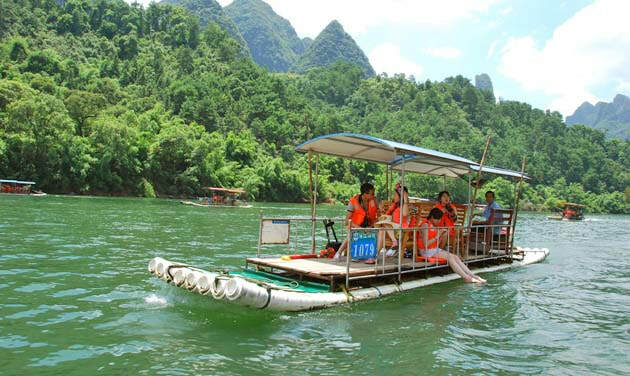 It's the most commonly booked cruise boat for foreign visitors among local Guilin tour operators. 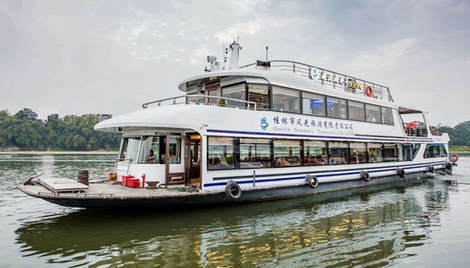 There are multiple boats (all of the same design, facilities and interior) departing daily from the Zhujiang Wharf on the outskirts of Guilin City. 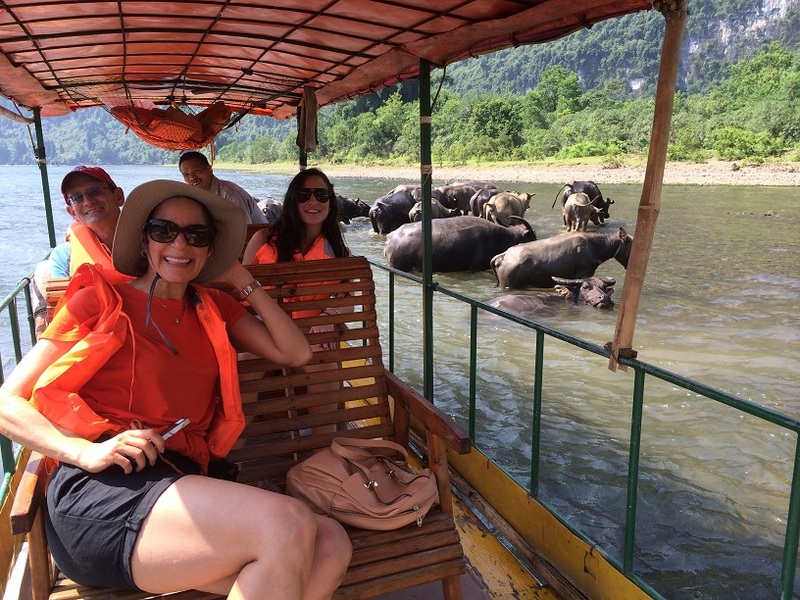 The Li River Cruise boats leave between 9:00 - 10:00 am each morning from either Mopanshan (3 Star Boat) or Zhujiang Pier (4 or 4.5 Star Boat). Both piers are very close to each other and located approximately 35 kilometers east of Guilin City. Therefore, if, for example, your cruise is scheduled to depart at 9:30 am, we would strongly recommend you arrive at the correct pier at 9:00 am at the latest. By arriving a little earlier, it allows you to clear the security check and board your corresponding boat without any time pressure. Considering the cruise departure times (between 9:00 am - 10:00 am), we recommend visitors who fly into Guilin in the early morning aiming to take a Li River Cruise to strongly reconsider this. If there is a flight delay (which is quite common in China) or a baggage delay, there's a strong possibility of missing the cruise. If visitors miss the boat cruise, no refunds are available. Alternatively, the trains and high-speed train arrival times are a lot more reliable and we can accommodate train station pick-ups. We can also accommodate airport to pier transfers based on the understanding above. IMPORTANT: Due to new policy for security & safety reasons, visitors are required to bring their passports for a security check (similar to airport check) when boarding the Li River Cruise.